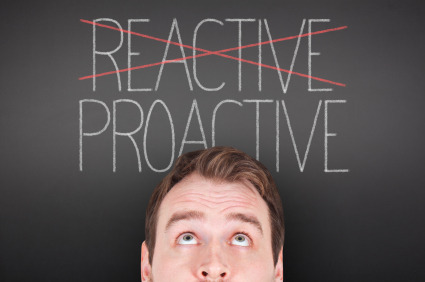 Is Your Janitorial Contractor Proactive or Reactive & Why It Matters? As a Facilities Manager, you are very busy and likely have an already towering to do list that verges on unmanageable. Most Facilities Managers look to their vendors to be solution based and take care of important details trusted to them in your building so that you don't have to. One service that can make or break your existence as a Facilities Manager is Janitorial. If your Janitorial Contractor is handling your account proactively, it can take a tremendous amount of weight off of your shoulders and allow you to focus on other things. If, on the other hand, your janitorial contractor is almost always reactive, it can create a burdensome situation that leaves you wondering why you bother outsourcing the janitorial at all. How do you know if you have a proactive janitorial contractor or a reactive janitorial contractor? A proactive cleaning service checks in periodically with you even if you haven’t contacted them about an issue. Likewise, when you do contact them about an issue, a professional janitorial company returns your phone call promptly. One complaint we hear a lot from Facilities Managers is how their Janitorial Contractor take excessively long to even return phone calls. Why would any company that wants to keep your business NOT get back to you quickly when there is a potential problem? Ignoring an issue or delaying a response is only likely to create more problems. But the truth is that many Janitorial companies don't plan their businesses around being proactive and at some point these reactive janitorial contractors decide that they are going into the complaint business. All too often, these reactive janitorial contractors pretty much stop doing inspections and stop openly communicating with their customers. They seem to expect problems and complaints rather than anticipate them, and they wait for the customer to communicate when there is a problem. The communications between the customer and the Janitorial Contractor start to become defined by problems as opposed to solutions. As a customer, it is hard not to become bitter because you are providing management services for your janitorial contractor, something you should not have to do for a fairly paid contractor. The Janitorial Contractor may even start to avoid communicating back to the Facilities Manager because after all, who likes to hear constant complaints. If you relate to this situation, there are a few steps you can take to either redefine the relationship on more positive terms, or to move on and find a Janitorial Contractor that will be proactive and deliver on their promises to you. 1. Communicate in writing whenever possible. This allows you to monitor trends in your Vendor's response time to your request and it helps you keep track of complaints and how they are handled. Always be specific in your emails in defining success for your vendor. Don’t tell you janitorial service provider that they are not doing enough, tell them specifically what they are not doing that you believe was agreed to. This way there is never any question about what you are asking them to do and no confusion as to whether it was followed up on or not. 2. Expect meetings with your Janitorial Contractor and follow-up notes with action items. If your Janitorial Contractor does not have time for such meetings, then the end of your relationship is likely near. Communication is the single most important part of delivering any type of services. We at Stathakis cannot deliver solid services without regular communication with our customers. How do we define and redefine the needs of our Facility Managers if we never ask them? 3. Insist on getting the cell phone number of the person who is responsible for your account. You should always have a point of contact with your Janitorial company. When something goes wrong you need to talk to a person, not someone's voice mail. And while no one likes having to hear an unhappy customer, a professional janitorial contractor does like to promptly resolve issues and keep you the customer happy. The person responsible for handling your account should be easy to reach and receptive to finding fair solutions to issues that come up. 4. When in doubt, refer to your Workload Specification in the contract. A proactive janitorial company will have a very detailed specification that defines the exact service they are promising to perform. This is the basis for a successful relationship between a Facilities Manager and a janitorial service provider. How else can a contractor be clear on what they need to do successfully deliver janitorial services in your facility? And things change, so a specification should be revisited at least a couple of times each year as your service needs change. A proactive janitorial company will likely check in with you on this but you can also ask to sit down and revisit your workload specification. This is especially helpful if you have remodeled your building or had an influx of new tenants or other major changes. 5. Don't ever settle for not having your emails and voice messages returned. The Building Service Contracting Industry is very competitive and there are always companies out there who will appreciate and earn your business. Out-sourcing your janitorail should work for you. It you openly encourage good two-way communication with your contractor, than it is reasonable to expect they call you back in a timely fashion. If they do not, find a janitorial company that will. So ask yourself, do I have a proactive or a reactive contractor? A proactive contractor schedules visits to tour your building. A proactive contractor is solutions-based and is always looking for better ways to service you. A proactive contractor promptly returns phone calls and answers back emails. A reactive contractor only appears when you ask them to address a problem. A reactive contractor expects you to inspect the building for them. A reactive contractor is late to return phone calls and answer emails. Most Facility Managers don’t expect perfection; they expect a fair return of value for their janitorial dollar. If you aren’t getting the kind of responsive janitorial service that makes you feel like your janitorial contractor values your business, maybe it is time to look elsewhere.